Cheri Huber has been a student and teacher of Zen for over 30 years. Her gentleness, clarity and humor support the challenging work of spiritual growth. She is the author of 19 books including There Is Nothing Wrong With You; The Depression Book (she has been acknowledged as the country’s foremost expert on depression and spirituality), When You’re Falling, Dive; and her most recent, Transform Your Life: A Year of Awareness Practice. 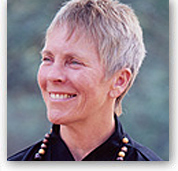 Cheri founded the Palo Alto Zen Center and the Zen Monastery Peace Center in California. She conducts workshops and retreats at these centers and at venues around the U.S. and internationally. She has an Internet based weekly call-in radio show, Open Air. Cheri is a member of Social Venture Network, a national organization that combines social responsibility, spirituality, and business. She is founder and director of Living Compassion, a nonprofit organization dedicated to peace and service. Cheri regularly offers public talks and workshops. If you are interested in finding out more about Living Compassion, the Zen Monastery Peace Center and the Palo Alto Zen Center, including retreat schedules, regular practice opportunities and workshops, please visit Living Compassion's web site.